No butter is needed is these bejeweled Red Currant and Rosemary Olive Oil Scones. The kids are back in school and our life has returned to it’s usual chaotic schedule. Throw my husband into the mix and we have pure pandemonium in our house. Luckily, we live in near paradise. There’s nothing like relaxing in Mission Bay, toes in the sand, with kayaks and paddle boards on hand to help you (and the kids) decompress from the daily grind. Summer is still going on strong in our house, despite what the calendar says. I am not quite ready to give up my summer produce, the warm sunshine or my flip flops. There is nothing more thrilling for me than to explore the produce aisle or farmer’s market and sample new fruits or vegetables. I have always been curious about currants. I have only seen them online (like here in Masala Herb’s post), never in person. 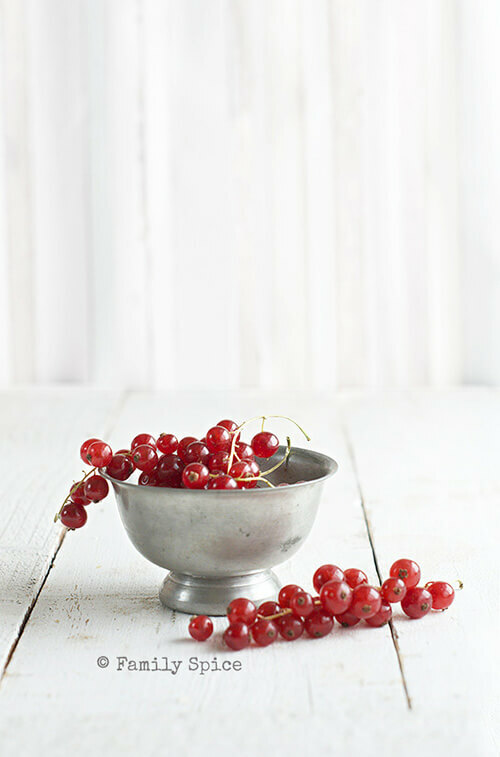 There is something mysteriously beautiful about ruby red currants. They are luminous, brilliant, little jewels provided by nature. So when I found them fresh and gloriously bright, calling my name, I snatched them up. To me, they are shiny jewels, so I studded my scones with this gems. Red currants (or redcurrants) have a sweet and tart flavor, perfect for scones, which are supposed to be mildly sweet. Rosemary compliments the red currants beautifully and I swapped out the butter and used extra virgin olive oil and Greek yogurt instead. I chose to use a blood orange olive oil for these scones, so you will also taste a wonderful hint of citrus. They turned out beautifully, my bejeweled Red Currant and Rosemary Olive Oil Scones. I hope you will enjoy them, too, along with what is left of summer. Preheat oven to 400ºF. Line a baking sheet with parchment paper or a silicone baking mat. Turn the dough onto a lightly floured work surface and shape into a circle or rectangle, about 1/2-inch thick. Fold the empty half of the dough over the red currants, pressing the two layers together. Transfer scones to a cooling rack to cool to desired temperature. Serve warm or room temperature. Serving Suggestions: Serve alone, with honey, jam or drizzle a sweet glaze on top. Cooking Tips: Use a buttery or citrus infused olive oil. Ciao Laura, complimenti per il sito. Ti seguo da poco tempo. Ho sfogliato quasi tutti i tuoi post, mi piacciono molto le tue ricette e anche gli articoli non di cucina. Il tuo paese suscita in me una forte attrazione. 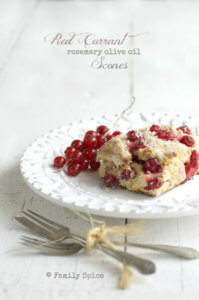 Amo gli scone, questa versione con i ribes rossi è irresistibile. Un abbraccio. 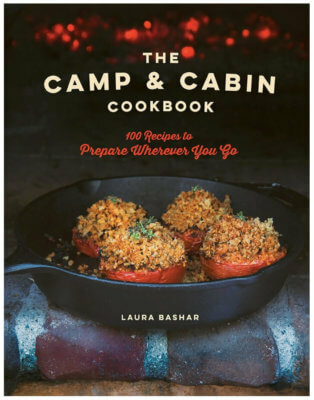 Laura, these sound delish. I will try to find all of the ingredients so I can make a batch to take to Girls Weekend in Rancho Mirage next weekend. Hugs to your family. Thank you, Deb!I hope everyone enjoys them. Oh, and have fun with the girls! I almost never see red currants! Well, outside of jam or jelly. 😉 I really need to track some down — these scones look amazing! Thanks. Gorgeous as always, and I love how you described them. Great writing friend. I’m on a hunt for red currants. I haven’t seen many things that look this good. 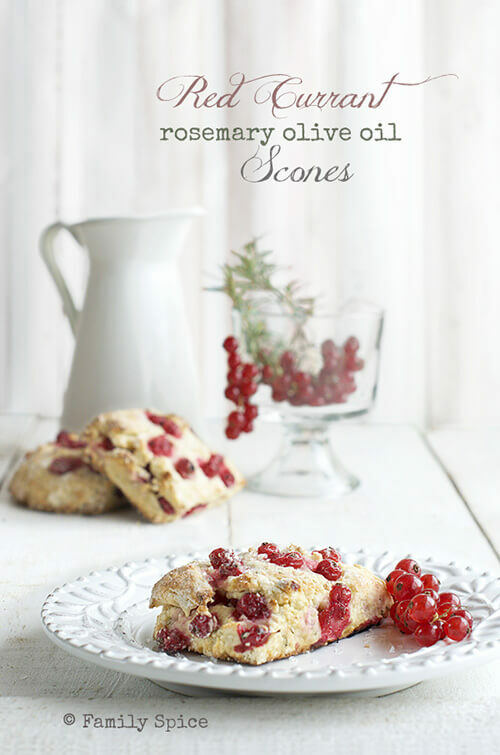 Your Red Currant And Rosemary Olive Oil Scones looks so delicious. And all your pictures are looking great, well done Laura! Hi, do you think I can you almond or coconut flour for these scones? Coconut flour and almond flour have very different textures and react differently in baking. I have been dabbling with with both, but it is for sure not a one to one substitution.